The best-known Edinburgh administrator was Ian Branston; imaginatively known as “Pickles” by his Scottish colleagues – and he ran the Granton club. 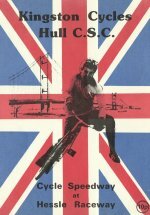 I wrote to him some time in the summer of 1966 and he was kind enough to send me copies of the Edinburgh CS magazine – called ‘Smoke signals’, I think – as well as blank programme formats and some actual match programmes showing results. 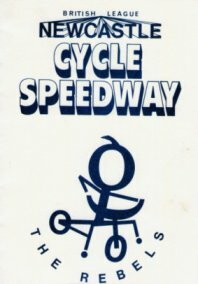 This was especially useful, as we had been using Speedway formats in our racing, and Cycle Speedway matches were run over a different number of heats, ending with a nominated race where the riders were selected just prior to the heat itself (at this time, cycle speedway still used the 3-2-1-0 points format). We in Shields were already trackless by this time and rider activity was at a low point. 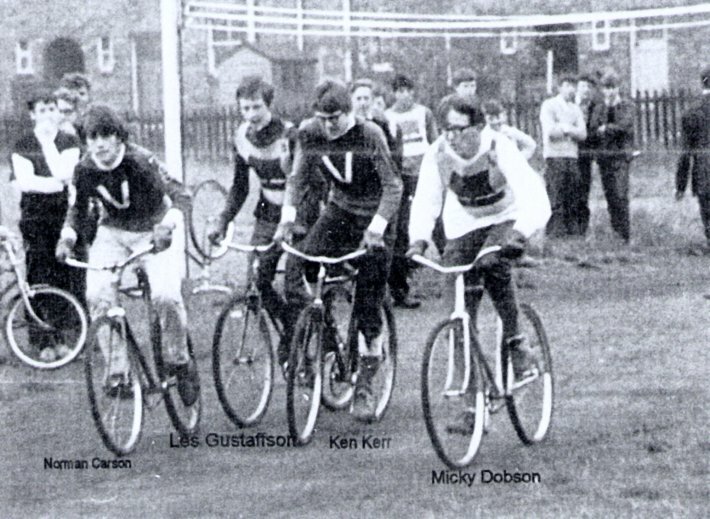 Mike Dobson and I used to ride in Newcastle meetings, but many of the Shields riders were inactive. 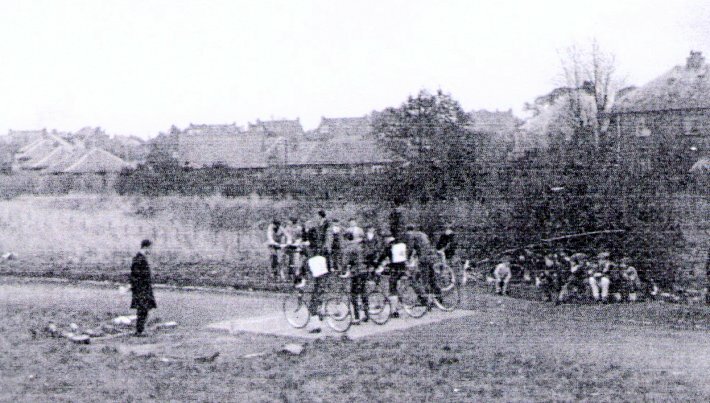 Lack of a track was a serious handicap, so when the question of racing against team(s) from Edinburgh came up, it was entirely logical that the venue should be Newcastle and the matches organised by the Newcastle club, which had moved from the track in Moorland Park to a more suitable location on Monkchester Rec, and had also enlisted adult participation in running the club. The coach from Edinburgh came down to Newcastle on 6th October 1966. 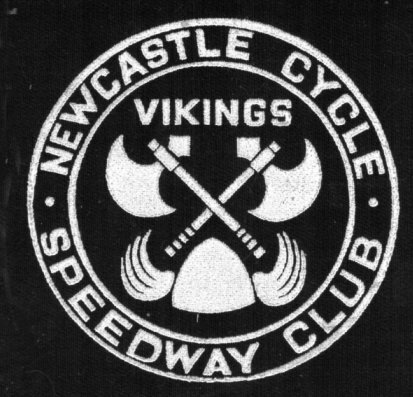 Ian Branston brought two of his intermediate teams – Granton Griffins ‘A’ and Belle Vue Aces, with each side riding a match against Newcastle Vikings and Trow Lea Mariners. 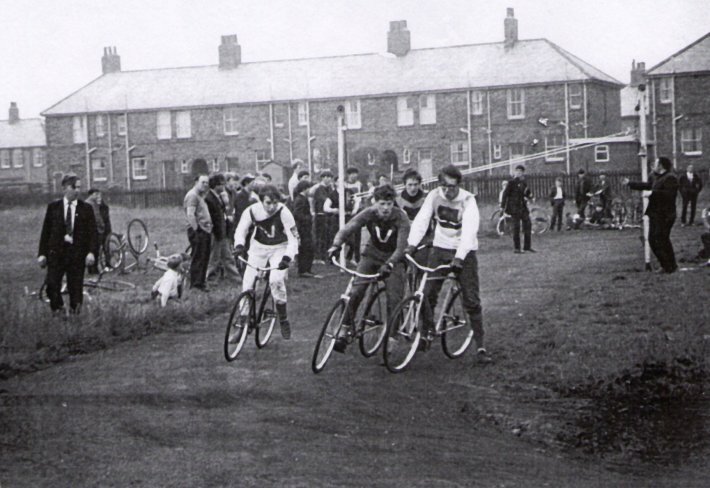 I’m fairly certain that the track was not the one usually associated with Monkchester Rec, rather one parallel to where the main track would be, but closer to the housing on the other side of the Rec (?) One thing is sure, however, that it was very muddy due to heavy rain for some days previously, and as the various matches progressed, came to resemble a quagmire. We only managed a scratch team that day, tracking just four riders from our own resources and supplementing them by local riders not in the Newcastle line-up. 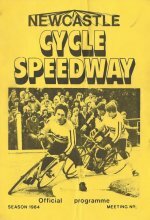 Oddly, Gess Atkinson wasn’t in the Newcastle team that day and we were pleased to add him to our match programme, especially so because he managed two heat wins in a nine-point total against the griffins. Eddie Murray was another loanee and he scored the other heat win we managed against the Griffins. We lost heavily against both Griffins and Aces, but Newcastle ran the Griffins very close in their match, and logic suggests that they may have defeated the Aces – but the Newcastle v Griffins score sheet was only unearthed very recently, and there appears to be no sign of any programme for their match against Belle Vue. 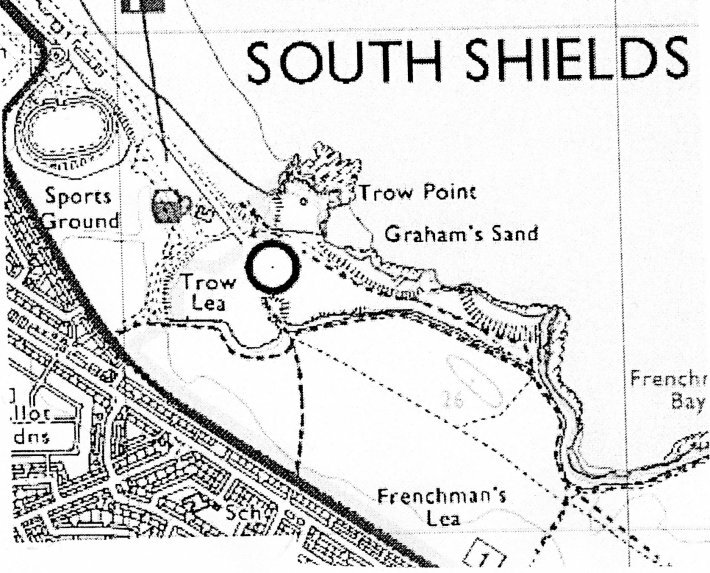 I also remember the after-match, slap-up tea in one of the Monkchester Rec huts, which was all the more welcome as we were absolutely shattered and still had to pedal all the way home to Shields. 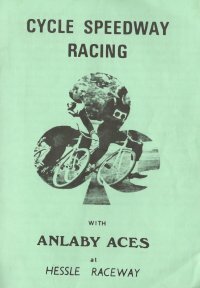 (In fact, a recently-unearthed report from the Cycle Speedway Gazette of the time shows that Newcastle lost by a greater margin against the Aces than against the Griffins). 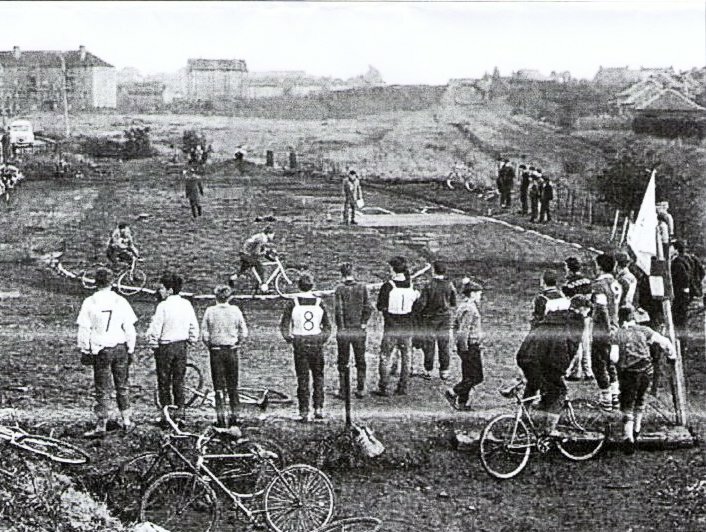 Strangely enough, Trow Lea did much better in Edinburgh two weeks later – both from the point of view of own-rider participation and performance (we tracked six riders who had appeared in South Shields matches in 1965 and early 1966). 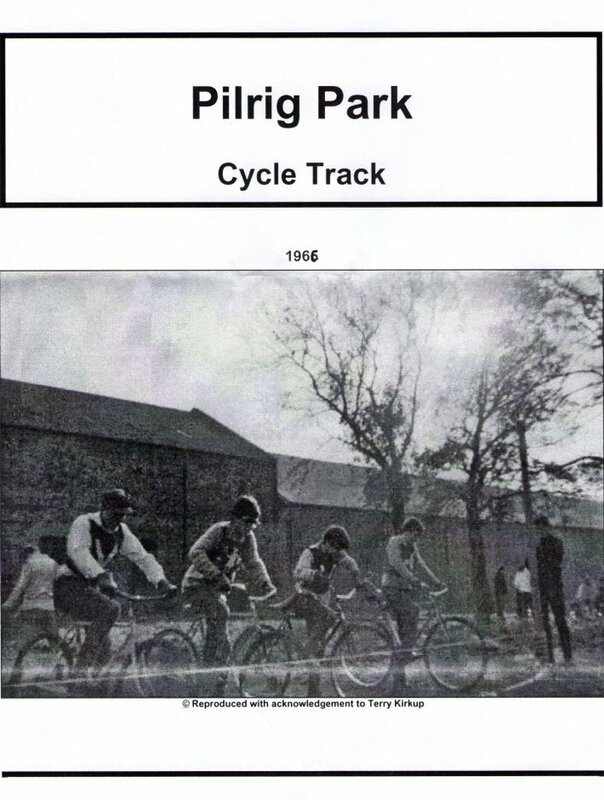 At Pilrig Park (an ordinary hard-earth circuit) Doug Atkinson scored 8 points, including two heat wins, and at Davidsons mains (a Rolls-Royce of a track compared to anything we’d ever seen) I got 8 points, including a last-heat 5-1 with Mike Dobson – in virtual darkness, as the clocks had just gone back, but Doug and myself were just in supporting roles to Mike Dobson, who scored 10 points in the first match and twelve points in the second one, with five heat wins from his ten rides. We just lacked a third solid scorer in each match. 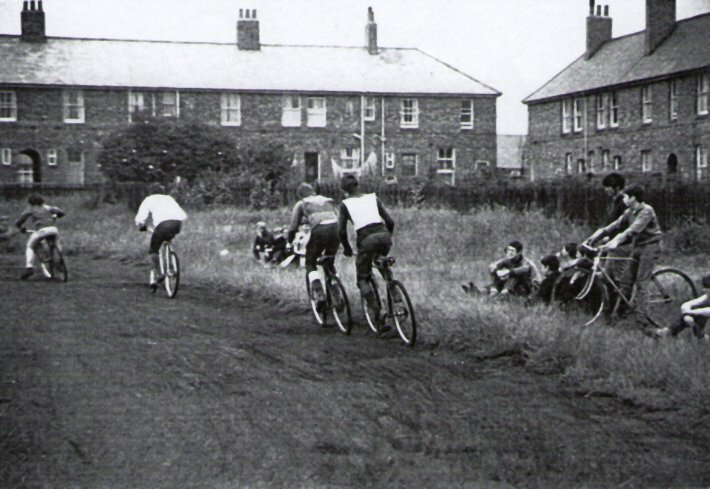 The two photographs above are of action at Davidsons Mains, Edinburgh’s premier track, during the Sixties. 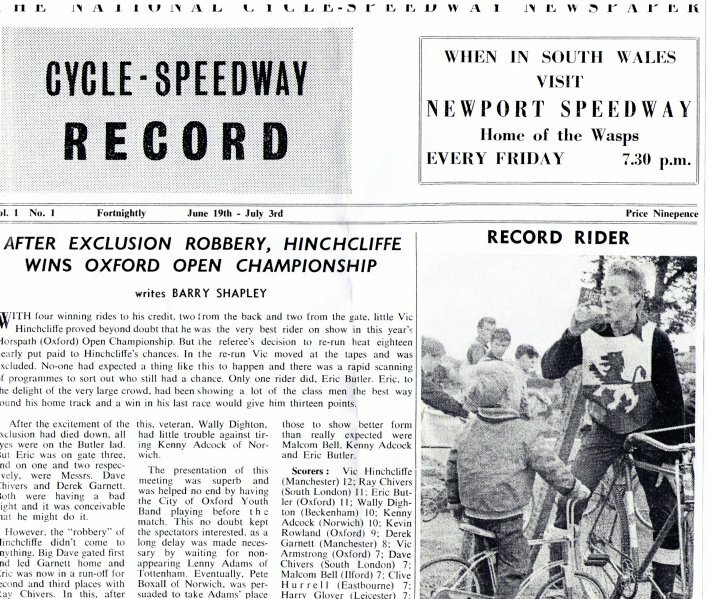 Dave Beecroft has correctly identified evergreen John Murphy as the rider in 2nd place in the first photograph. John is still taking to the tracks fifty years later - although sadly not at Davidsons Mains, as there is now only one Edinburgh track, in the town’s Redbraes Park. 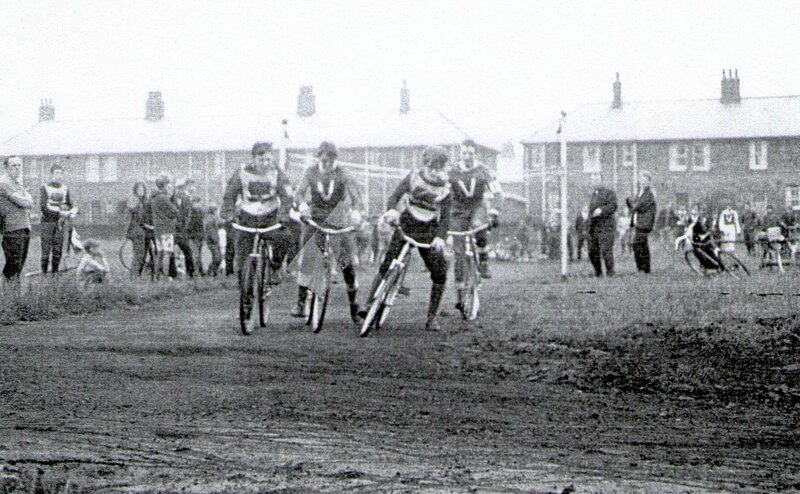 Ray Turner and Mike Dobson, South Shields Individual Champions of 1967 and 1965, respectively, line up on the outside grids in an individual meeting at Newcastle. Inside them are Peter Burns and Norman Carson of Newcastle. 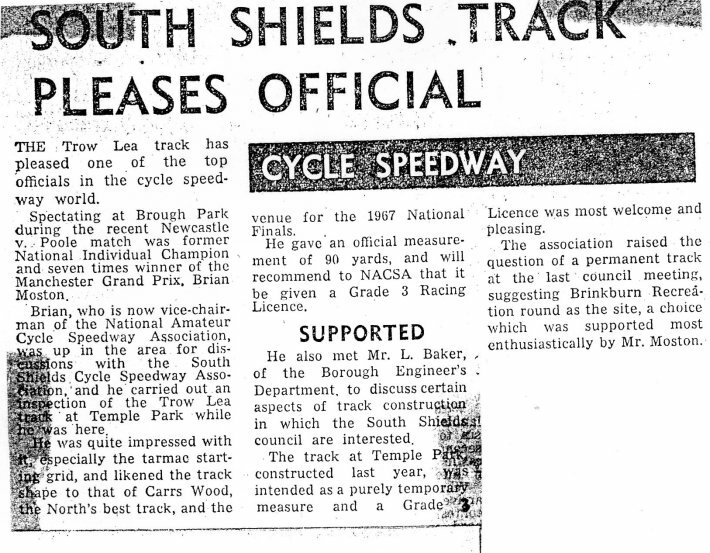 Ray could probably lay justifiable claim to the title “1966 Tyneside Rider of the Year”, having started the season with a 20-point haul in the inaugural Tyneside Test Match and ended the year as Tyneside Best Pairs Champion (with Keith Thompson), scoring a 15-point max in the process. He could certainly have taken first place in a Freddie and the Dreamers look-alike contest (see the photos in the Newcastle 1965-70 section). 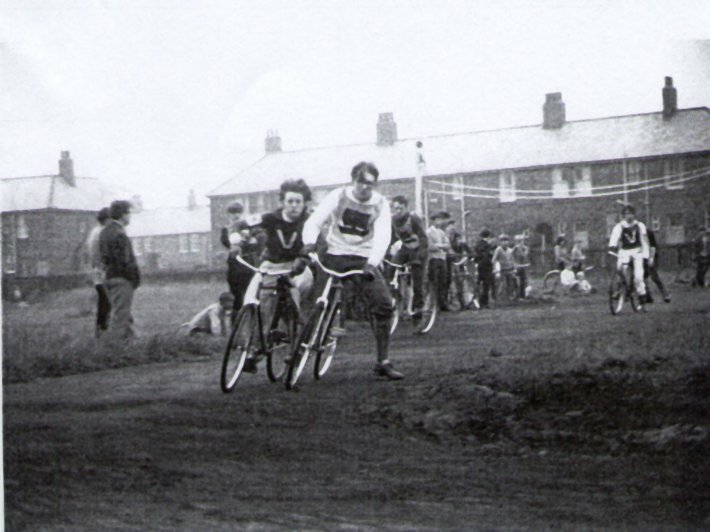 Mike Dobson probably considered Keith Thompson and Jim Braney as challengers to his position as the leading rider in Shields at the start of the 1966 season, but by the end of the year he was the undisputed top rider, as his two double-figure scores on the October trip to Edinburgh demonstrated. The Tyneside Best Pairs of 1966 was denied a last-heat confrontation between Ray and Mike when the latter was excluded for moving at the gate. If that meeting had doubled as the Individual Championship then Ray would have been the runaway winner, racing unbeaten in his five rides. Mike would have been runner-up, ahead of Les Gustafson by virtue of more heat wins within the same points total. Norman Carson was the other double-figure scorer with 10 points. The climax of the 1968 Tyneside Test at Newcastle - Ray Turner hits the front for Shields in the final heat, while Newcastle’s Kenny Kerr tries to squeeze between him and Jim Graham. On the sidelines (2nd from the left in his Shields breastplate and holding the clip-board) rider-manager Les Gustafson looks on optimistically, as Shields need only a 3-3 to clinch victory, but trailing Terry Kirkup somehow manages to come through to win the heat and Kenny Kerr relegates Jim Graham to last place. The resulting 4-2 for Newcastle ties the match at 53-53. Trow Lea Mariners travelled to as many away tracks as possible, given the constraints of transport – partly to do with the long period of having no home track, but also from a desire to experience as many different types of track as possible (from Halifax’s saucers to Kingstanding’s more substantial circuit, and others in between). The only time we didn’t give a halfway-decent account of ourselves was at Bridgend in Edinburgh in late ’67. Five of us shoe-horned ourselves into Terry Kirkup’s car (with bikes on the roof-rack) and drove up to Edinburgh to face Bridgend Bats, who had just won the Edinburgh League Championship. 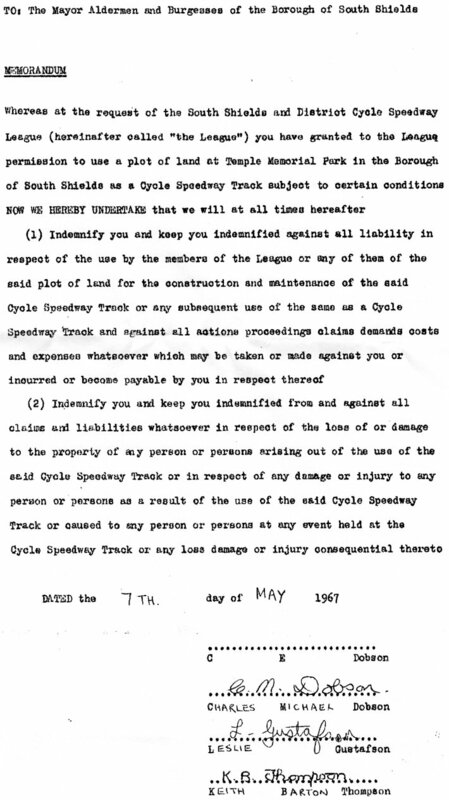 We disgorged ourselves from the car – Terry, Frank Auffret, Mike Dobson, Jim Smith and Les Gustafson - to be met by Jackie Pinkerton, who had agreed in advance to make our numbers up to six. 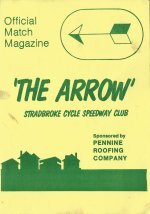 The match was only three weeks after our trip to Kingstanding and we had only just got back our bikes after British Rail had sent them on a roundabout trip back to Tyneside - having collected them from the Doncaster garage where we’d been forced to abandon them - and we had all sorts of bike problems in the match. 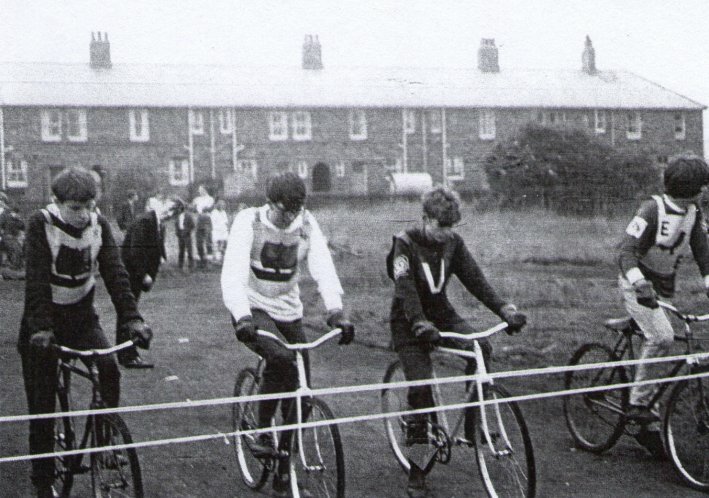 Jackie Pinkerton rode two races for us and then obviously decided that we were a lost cause, cycled off and wasn’t seen again – can’t say we blamed him though. He must have thought that we were a ramshackle lot. 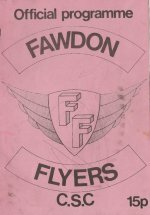 (We pulled ourselves together, however, for the second match at Davidsons Mains, where we defeated the Griffins, having lost there a year earlier). 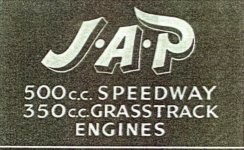 Bridgend were supposed to be the opponents in the opening home match of 1968 at Temple Park, but they pulled out at the last minute. 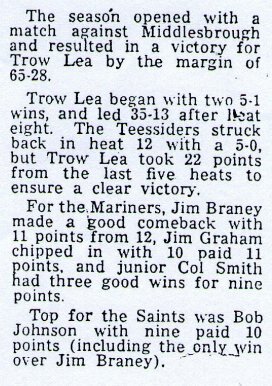 They had been scheduled to race matches against Trow Lea and a fledgling Middlesbrough side, so these two teams raced each other instead. The report of match appears below, and the repeat encounter later in the season is covered in the Middlesbrough section of this site. Heat 5 Norman Carson flies off Gate 4, to attack Mike Dobson on the first bend, and the second photo shows him leading into the 3rd bend - but Mike obviously manages to regain the lead before the end of the heat, as he crosses the line in first place. 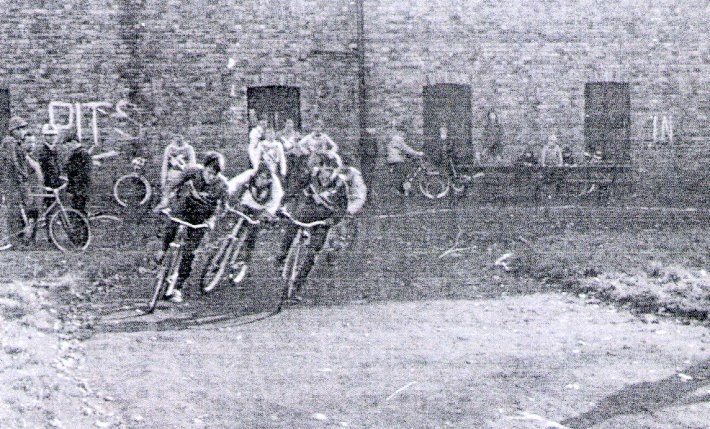 Behind them, Les Gustafson makes a last-bend effort to go round the outside of Kenny Kerr, who drifts him out so wide that he has to take evasive action as they cross the line, to avoid colliding with George Grant’s solid starting gate, and in so doing runs over the legs of two spectators lying by the side of the track (but at least avoids a repeat of the incident in the 1949 Newcastle v Edinburgh match, where home rider Alex Temple rode into the starting gate and broke a toe). Heat 13 Mike Dobson off Gate 1 reaches the first bend in front and starts to ease Gess Atkinson and Keith Dyer away from the inside line. His lurking team-mate Les Gustafson takes the opportunity to come through the gap into the lead, and Shields enter lap two in a 5-1 position and hold it for the rest of the heat (the only one of the match). Mike Dobson is so far unbeaten by an opponent. 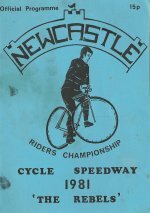 (Norman got his revenge in heat 17, when he became the only Newcastle rider on the day to head home Mike Dobson, bringing Newcastle to within two points of Shields and setting up the dramatic last-heat decider. The single photograph of the heat shows that Mike had again made the gate, but Norman was all over him and eventually got past, and this time held on to the lead until the chequered flag). 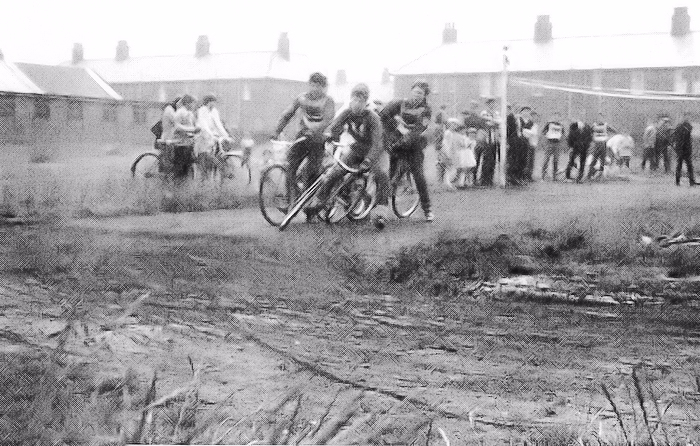 Heat 17 was a mini-drama in itself, apart from Norman being as close to Mike Dobson’s bike as it was possible to be without riding pillion. Les Gustafson had withdrawn himself from heat 16 and brought in tactical reserve Jim Smith, and then withdrew Mike Noutch from heat 17 to give Jim another outing. 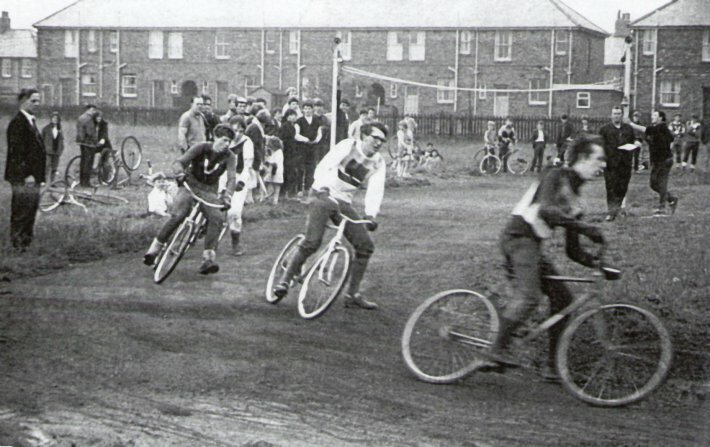 The photograph shows Newcastle’s Keith Dyer at the rear sitting up – the match programme has him as being excluded, but none of us can remember the reason – so all Jim had to do was stay on his bike for the rest of the race. Unfortunately, he managed to fall off and didn’t remount, so there were only two finishers to the heat, one of several races where points were dropped due to non-finishes. 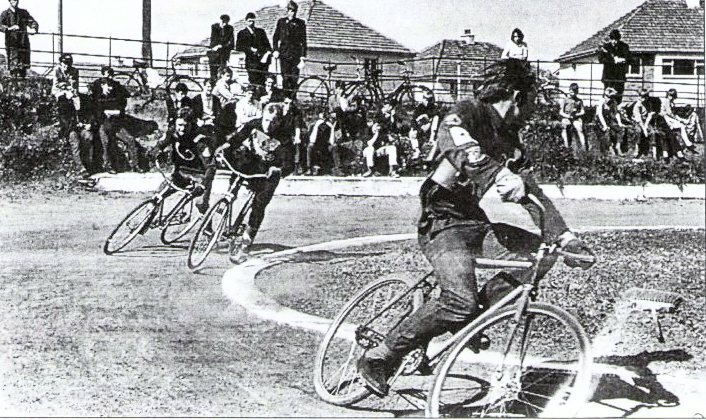 Les says: "Tangle at the first bend of Heat 8 Gess Atkinson emerges in the lead while an almost-invisible Keith Dyer in white clashes with Eddie Murray and Jim Graham. The resulting 4-2 is the home side's first heat win of the match."